My Dad died 22 months ago I sometimes feel him around me at times I found some of what has been said of some comfort. Sorry to hear about your dad’s death. I’m glad this article has given you some help and comfort. That’s a tough one. Are you close to your parents? I lost my dad in a fatal road accident. He died because of brain dead and we as a family are feeling to hard to get out of it. We believe still he dwells with us and as if we imagine dad has gone out of home for buying groceries. I literally feel like I need to have a discussion with him on my future plans. Though I’m 25 yrs old guy, I always seek my dad’s guidance in each and everything I do and I did. Now that I have missed a good friend and teacher. Donno how hard the life is going to be from now on as well as a elder son seems like more responsibility on the way. For things get moving I’m stubborn on getting only my dad’s guidance to take it forward. We do keep him in our daily prayers to make sure his departed soul should rest in eternal peace. Praying to god the almighty chriat, for keep my dad’s positive and happy memories and make me forget from the fatal accident thoughts. I’m so sorry to hear of your father’s untimely death. Our thoughts and prayers are with you and your family. I hope this article is giving you some help in dealing with your father’s death. The article was meant for people whose parents died in old age. When parents die younger, it is even harder. But many of the thoughts in the article still apply. It will take time to grieve your father’s passing. There is no way around that. However, to help balance out the grieving, a positive thought is that you had a wonderful father who taught you and guided you throughout your childhood and teenage years, and into your young adulthood. That’s something not even his death can take away. Though you no longer have his physical presence and his continued words of guidance, everything he has taught you and shown you is now a part of you, and can be a guide as you move forward in your adult years. Now, as the article says, your task will be to become your own man, adopting for yourself all of the good and the wisdom that your father gave you, and adding to it your own experience and growing wisdom in living your life for the benefit of God, family, friends, neighbors, and of course your own physical and spiritual wellbeing. I lost both parents and I am now living on my own. Despite the fact that the Lord provided me everything that I need in life to survive.. Something in me still missing. Months after my mom died, I really desire to follow..
And now I’m scared of what if she can’t remember me anymore? My friend shared to me that after death we cannot remember anymore our relationship. But still, heaven is overwhelming. This idea really makes me sad. I am trying to move on now. The Lord provided me a job that occupies me. I am sorry to hear of your struggles. Losing those who are close to us is a painful blow. The wounds can take a long time to heal. About your friend, what can I say? I don’t agree. All evidence points to the opposite conclusion. For example, people who have near-death experiences commonly report meeting family and friends on the other side, who love them and understand them even more than when they were here on earth. Do not be concerned. Your mother remembers you and is still close to you in spirit. And though it’s natural to want to follow and rejoin those we’ve lost, it sounds like the Lord still has work for you to do here on earth. And when the day comes that your labors here are finished, you will rejoin your mother and all the other people you have loved and lost by that time. Your writing here gives me a great strength. I wish this is true and I will be able to see my mother. I’m sorry to hear about your mother’s death. I’m glad this article has given you some help and comfort. Our thoughts and prayers are with you. What so when I die I will see my parents and talk to them and when my brother and sister die I will see them to but where will I see them lee??? Yeah but if i will go to heaven will i see them there too? Thanks for stopping by, and for your question. If both you and your family members and friends have chosen heaven over hell, then yes, you will see them in heaven. However, if you are very different in character, personality, and goals, you may be living in different parts of heaven. But you can still visit any time you want to. One more question lee when you go up to heaven to you have to find your parents when you go up there??! You will not have to go in search of them, if that’s what you mean. In the spiritual world, thinking of people and wanting to see them brings them close to you. You will be close to the people you love. I recently visited a Medium, I know some will argue that these people are frauds some will say they are doing evil work. I never felt that I got great comfort from the reading there was too much information that the medium, said that only I would know. Going to a medium helps but it never takes away the pain. Holiday times such as Xmas, are some of the hardest. Thanks for stopping by, and for your comment. Yes, holidays, birthdays, anniversaries, and other times of celebration are some of the hardest days for those who have lost loved ones. The best hope and comfort comes from accepting the assurance of sacred scriptures, spiritual teachers, and near-death experiencers that our loved ones who die have moved on to a greater and more beautiful world, where they continue their lives and their spiritual journey. Of course, this is talking about after you, too, have died. If your parents have died and you are still here on earth, you will not be able to see them unless, perhaps, you happen to have a near-death experience or some other spiritual experience in which you encounter them in the spiritual world. After you die, though, you can be with them in the spiritual world in exactly the same way you were with them when both you and they were still alive here in the material world. You can talk to them, touch them, hug them, take a walk with them, sit down to dinner with them, take a drive together, go sailing or play tennis with them–whatever things you enjoyed doing together here on earth. Sorry to hear about your great-grandmother’s death. Did she have a good life? In heaven, most people don’t live alone “in their own world,” but together with others in smaller or larger communities, very much like our villages, towns, and cities here on earth. The people in our community in heaven are those who share similar values, beliefs, and goals in life. If you and your parents are similar in these ways, you will live forever in the same community with them. But if you’re different from them in your values, beliefs, and goals, you’ll live in a different community from them–though you can still visit them whenever you want. My father died 2 years back but I am feeling same pain and helplessness and sesire to meet him again now also. I have his photo on mobile phone and can only say I can give up everything on this earth just to meet you once again. papa are you listening ? Sorry to hear about your father’s death, and the pain of your separation. It sounds like you were very close to him. I’m sure he is listening, and holding you in his heart. But you still have many things to accomplish here on earth before you can meet him again. I’m also sure he would want you to do good things here, and grow into a strong and well-grounded person before joining him in the spiritual world when the day comes that your life here in this world is complete. I’m so sorry to hear about your parents’ deaths, and your struggles getting along in life without them. Losing the people we love is one of the most difficult and painful experiences we can go through. I do hope this article has helped at least a little. There’s really nothing I can say to take away the pain. It is something we just have to go through. And it can sometimes take years to recover. Please do know, though, that your parents are still very much alive, even if they are no longer living here an this physical earth. They have a good and happy life in the spiritual world, and I’m sure they are with you in spirit, and sending their love your way. They would not want you to suffer, but I’m sure they also understand how hard it is for you to be without them. Still, I hope you will be able to find some peace, and take the difficult steps to move forward with your life, and become a stronger and more compassionate person as a result. When we lose someone we love, it gives us the ability to empathize with others who have experienced loss. I don’t know anything more about you, your parents, and your life than what you’ve shared here, so I can’t say anything much more specific than that. I would encourage you, though, to seek out a pastor or counselor in your community, or just a trusted friend, and do the hard work of grieving for the loss of your parents and moving forward with your life. I think your parents would be pleased to see you building a life for yourself and becoming a good and strong person. Once your struggles here on earth are over, and you’ve fought the good fight, then you can rejoin your parents and others you’ve loved who have passed on, and become an angel of heaven along with them. Same here. I just want to join my father right now who has passed away about a month ago. Thinking of attempting suicide. I’m very sorry to hear about the death of your father, and the painful position it has put you in. Of course, it’s your decision what to do. I would only suggest that your father would almost certainly rather you stay here on earth and build a life for yourself, so that the care and love he put into raising you can bear fruit. It would be honoring his memory and giving him joy if you moved forward through the pain and loss and went on to do good things with your remaining years here before rejoining him in the spiritual world when it naturally comes your time to die. For some further thoughts on this in response to a man who had recently lost his wife, please see my comment here, and the article above it about suicide. Thanks Lee. This was a great article. I’ve been very suicidal ever since i lost my mum in ’07. Whenever I remember all the good times and happy moments we shared i get so depressed to a point i just want to end my life and go to where she is so that i can continue to be happy with her. Is there a way i can see and talk to her now that I’m still alive? I’ve never come to terms with her death because i was in a coma when she died only when i woke up was i told that she’d died. I really really really want to be reunited with my mum as soon as yesterday! I don’t think I can bear this pain any longer. Please help. I’m very sorry to hear about your mother’s death, and your grief and suicidal thoughts and urges since then. It is very painful to lose the people we love most dearly. I invite you to read my words to Nicola just above. About suicide, I won’t try to sugar coat it. It’s a terrible presence for those in great grief, and yet it is one to overcome if at all possible. For more on this, please see my article, Does Suicide Work? No, committing suicide won’t send you straight to hell as some Christians believe. But it won’t solve your problems either. You’ll still have to deal with them on the other side. That may not be what you want to hear, but my hope is that it will help you to resist, if not overcome, your desire to kill yourself. Since you are still here on earth, I believe God still has work for you to do. And I think your mother would much rather see you struggle through your grief and move forward than end your life prematurely, and cut off the healing and spiritual growth you might have been able to accomplish during the rest of your lifetime here on earth. Though God sometimes does grant us contact with those who move on, most of the time that does not happen. And I can’t really recommend spirit mediums either. Perhaps some of them are genuine, but there is really no way of knowing who’s on “the other end of the line.” For more on this, see my article, What about Spiritualism? Is it a Good Idea to Contact Spirits? It is better, I think, to recognize that your mother is still very much alive and with you in spirit, even if you are temporarily cut off from communication with her. I believe she can sense your state of heart and mind, and that she still loves you and grieves that you are grieving. The greatest thing you could do for her is to go on with your life, face and work through your grief at losing her, and find a way to make a good and constructive life for yourself during your remaining years here on earth. This, I believe, is what would give your mother the most joy and satisfaction. And as I said to Nicola, I would highly recommend that you find a local pastor, counselor, or friend whom you can trust, and get some support and guidance. There are many people who would be glad to help you through. You are not alone–or at least, you don’t have to be alone. Many others have gone through the pain and grief that you are experience, and have been able to move on and build a good life for themselves. Thank you for your response. I’m going through your article on suicide now. Thank you very much! I gather that this article is based on an assumption that the parents are old and we are already adults, could you please enlighten me on how to cope with a parent’s death myself being only but a teenage girl who just lost the only woman she knew, her mother. Yes, this article was in response to a question from an adult reader whose parents had died after living out their lifetimes here on earth. So it’s addressed to a very different situation than yours. I am sorry to hear that your mother died when you were young. That is an especially difficult and painful experience, and my heart goes out to you. I wish I could say something that would make it all better, but I think you’re probably aware by now that there just are no magic pills to fix the gaping hole in your heart. Aside from offering you some comfort and assurance that your mother is alive and well in heaven, and still loves you, there is not a lot I can do from far away, not knowing you personally. However, I do hope you have found (or will find) some adults who can help you make it through. Perhaps the most healing thing would be to connect with others who also lost parents at a young age, so that you can feel the support of those who truly know what you are going through. I do not know where you live, but if you haven’t made contact already, perhaps there are pastors, counselors, or support groups in your area who can provide you with some of the personal and emotional support you need. Though there is a hole in your heart that may never fully be healed in this life, if you can find at least one or two others that you can open your heart to and trust to love and support you, it will go a long way toward getting you through to adulthood, and building a good and fulfilling life for yourself. And please know that although you have been dealt a cruel blow, God still loves you, and has good things in mind for you, even if you may not be able to see them now. I just came across this article. My mother left her physical body about 2 1/2 half months ago. It was sudden and we live in different countries.I had visited her little over 3 months back and told her that I will come back to see her in 3 months again. She remembered when it was close to 3 months and I told her that I will since I got little occupied with my family here. I planned to go little later.In few days after that conversation, she left this earth suddenly. God only knows my pain and agony and my helplessness here. I couldn’t be there and to save her. She had fever previous 2 days, I strongly feel if she was taken to hospital on time, she would have lived. My helplessness of not being there that time bothers me. I am unable to move on. I want to talk to her once. I couldn’t even get to talk to her last two days I called. I did sense that this should not be taken lightly like normal fever. Why did this happen? I have been fortunate to have a mother like her, an angel in this lifetime. God only knows how much I love her and I miss her every moment of my life. I couldn’t even see her to pay last respects. I want to know how her soul is doing now? I do have faith that I will see her when my time comes to go. but what if the soul of our loved ones have taken birth again, how will we see them. I want to talk to her so badly. I want to reach out to her soul and feel her and I want her to guide me along in life. Will she know what I am going thru’ and how I am feeling? I’m sorry to hear about your mother’s sudden death. If nothing else, these events remind us that our life here is precious, and we can’t take any of it for granted. I do understand your sense of helplessness, and probably guilt, about not seeing your mother again in time to perhaps save her life. And yet, though those thoughts and feelings may harass you, I would suggest doing what you can to make your peace with your mother’s death. Maybe you could have saved her, maybe you couldn’t. You’ll never know. But you can have at least some faith that our lives and our deaths are in the hands of God’s providence and God’s love. Your mother is doing just fine in her new home in the spiritual world. She knows that you love her, and she will certainly forgive you for not making it to her in time before she died. As they say, she is in a better place now. You don’t have to worry about her. However, she may be worried about you, sensing that her sudden departure has thrown a pall over your life. Yes, she will have at least a sense of your emotional and spiritual state, because she loves you and is therefore close to you in spirit. And how you move forward in life will give her joy or sadness as she moves forward with her new life in the spiritual world. I would therefore encourage you to take to heart what I said in the article, and consider this as something like a message from God, and perhaps from your mother also, that it is time to move on to the next phase of your life. Your mother is no longer here to help and guide you with her words and her physical presence. It is now time for you to begin to come into your own. This is what your mother was preparing you for. Now is your time to pick yourself up from the ashes of grief, and fully enter into your own life. That is how you will give your mother joy, happiness, and a sense of a parenting job well done. I know it’s hard. And yes, you do need to go through the grieving process. But that process should not stretch on forever. After you have mourned your mother’s passing, it will be time to move on with your life. This doesn’t mean forgetting about your mother, or no longer holding her in your heart. Rather, it means building on the foundation of love and guidance that she gave you from the time of your birth and right up to her death. P.S. If you’re wondering what your mother is experiencing now, please see my article, What Happens To Us When We Die? You might also enjoy the article, Who Are the Angels and How Do They Live? Thank you so much Lee. I appreciate your understanding and response. You are right about guilt in the first place, I have guilt for being preoccupied with my life here though I have been worried about her constantly. Not knowing whether I could have saved her or not bothers me. I don’t know whether death is predestined or not.It bothers me because she was such a wonderful good, pure hearted and she loved me so much that no one else could. I realize it was only me who could have done anything for her. I tried whenever I was around her, but without others help, it was not going anywhere. We live in different continents. I wish I had not moved away and stayed there, but it is too late.Also she was mentally preparing to go also. She did not have major illness. It bothers me that she was still doing her things and being independent till last day even with these. (that is how she wanted to live and go, At least god granted her wish. Maybe she felt lonely even with other people around her and not noticing her pain.She knew that her time on earth will not be very long now. She did a lot of donation to god and people and gave away what she had(she was the most compassionate woman I know and always giving)Only hope it gives me and in faith is we will be reunited. I will try my best to live my life with what she taught me. I haven’t recovered so far. That void will always be there. I also feel that she can sense my emotional state. I want her to be my spirit guide. Since I believe in reincarnation(many in my family have memories of their previous lives)however I do believe that she will not reincarnate for very very long and may not reincarnate at all. Also how will our souls communicate after the reunion? I’m glad my response was helpful to you. It really does sound like your mother lived and died the way she wanted to. Although it happened too soon for you, if she was able to be active and do the things she loved right up to the end, and then died after a quick illness, that sounds like the kind of death that many people hope for as they get into their older years. It’s certainly much better than hanging on for months or years with a deteriorating mind and body. When my own parents died, it was a different experience than yours. They did not die suddenly, they were ready to go, and I was ready to let go of them. Still, you might find an article I wrote based on that experience, and on my beliefs about life and death, helpful: When Death is a Celebration. About your question, my belief is that after we die, we go to the spiritual world, where we have a spiritual body that is just as real to us there as our physical body is to us here. So when we reunite with loved ones in the other world, it is just like seeing each other again here on earth. We can hug, talk, take a walk together, share a nice meal, and do all of the other things we like to do here. One more thing I am thinking, are we all connected not only in this lifetime and in other lifetimes also? I hope so. I know many people believe in reincarnation, but I do not believe it actually happens as commonly understood. For more on this, see my article, The Bible, Emanuel Swedenborg, and Reincarnation. My belief is that your mother has moved on to a new life in the spiritual world, which will be her ongoing life for the rest of eternity. Her soul will not be reborn in a new body, so that you could miss her by dying after she’d been reincarnated. My belief is that no matter how many more years you live here on earth, you and your mother will still be able to have a happy reunion after your time on this earth is complete. And then she will want to know all about what you have done and accomplished in your life. So live your life! Reach for fullness in this life, and become the best expression of the person that your mother gave birth to years ago. She will not want to hear that you spent the rest of your life in grief at her passing. She will want to hear that after you recovered from the initial shock of her death, you continued forward with your life, and did good things with it. Your response has helped. God bless you. Yes, she lived the kind of life she wanted. But she was weak and suffered with breathing issues the last few months but pushed herself and didn’t want to trouble others. Sorry to hear about your parents. I will read your other articles. Read your article on when death is a celebration. It is a celebration in your case when you are ready to let go and when they are ready to go in their ripe age. you are lucky and blessed. About our belief system, we are carry different belief systems and different teachings, there is one truth. but the truth is something we don’t know. What is the truth is my quest. Will I know the truth is this life is my self inquiry. I am glad I am able to connect and write. Thank You. Yes, I understand. I recommended that article mainly for the general view of death as a natural and spiritual part of life. And I understand that your beliefs are different than mine. Regardless, we continue to wish you strength and growing understanding as you grieve your mother’s death. I’ve been doing a lot of research about the afterlife lately and, honestly, these articles give me some comfort. My parents at the moment are still rather young (early-mid 40s, I’m 15) and I couldn’t be happier living at home. However, and I feel rather silly for being so frightened of it, I’m terrified of the day they pass away and leave me alone for the remainder of my time on Earth. This has been happening for 2 months straight now, and whilst your articles have given me some relief, I’m still having doubts and I’m so scared that my parents will be gone forever once they die. If you could give any advice, I’d greatly appreciate it. It sounds like you think a lot! And that’s good. I’m glad these articles are helpful to you. Naturally, at this time in your life, the possibility of losing your parents is a scary thought—especially since you’re very close to them. Later, when you are an adult and are making your own life, it will get less scary, even if it will still not be a pleasant thing to think about. But for all of us, the time comes when our parents’ time here on earth is over. Fortunately for me, my parents lived good, long, fulfilling lives. They were ready to go when their time came, and I was in my fifties, so it really wasn’t a traumatic event for me. You can read my thoughts about it, and about death, here: When Death is a Celebration. My hope for you, of course, is that your parents will live good, long lives, and that by the time it is their time to go, you’ll be ready to let them go from this earth. It’s natural to have doubts. In fact, it’s even a healthy thing, because it causes us to look into things more carefully and deeply, and come up with better and more satisfying answers. I would encourage you to keep looking and learning. There are plenty of other articles on this website about the afterlife, such as: What Happens To Us When We Die? And for the most detailed eyewitness account of the spiritual world ever written, see: Heaven and Hell, by Emanuel Swedenborg. Another place to look is to the literature about near-death experiences. Here is one place to start: A Short(ish) Video Course on Near-Death Experiences. You’re still young, and you clearly have an active and inquiring mind. My suggestion is to keep looking and keep learning! As Jesus said, those who search will find (Matthew 7:7-8). Hi Lee!what about small children that die?How will they know their mom and dad when they die If they still havent developed a relationship?How old will they be in spiritual world? In the spiritual world, we have access to much greater information and insight than we do here on earth—even in this age of information technology. For parents who want to meet their children who died as infants, and people who died as infants who want to meet their parents, the information about their identity is easily available in the spiritual world. As for their relationship, think about children who were adopted at birth and as adults search for and find their biological parents. Of course, there are many different ways it can go when they finally meet one another after having been separated since before the conscious memory of the child. But they often do form close relationships even though they had no relationship growing up. In the spiritual world, however, relationships are formed primarily by similarity of character, worldview, and goals in life rather than by biological and bloodline connections. So the continuation and quality of the relationship of parents and children separated at birth will, over time, depend upon whether they have similar or different characters and perspectives on life. Those who are very different in character and perspective will drift apart from one another, just as they commonly do here on earth. Those who have a similar character and perspective—which is ultimately determined by the quality of their primary, driving love—will continue to have a relationship. However, in heaven, biological and bloodline relationships gradually fade. Angels do not think of other human beings as their parents or children, even if they may have been parents and children during their physical lifetime on earth. Rather, they all think of God as their Divine Parent, and themselves as all being children of God, and brothers and sisters to one another. Also, babies, children, and teenagers who die all grow up to adulthood in heaven, and become adult angels. None of them remain babies, children, or teenagers in heaven. For more on this, see: Where are my Children who have Died? Will I Ever See Them Again? I lived with my parents all my life. I lost my father in 2007 after his health deteriorated. I was devastated. Then my mother supported me and since then we both looked after each other. We lived together, went out together, did tours together. Just 6 months ago, we had done a US trip for 2 months. We hardly left each other. Luckily, I was able to work online from home. So there was never a problem of leaving my mother alone at home. We were both very fond of each other. She had diabetes and BP. But she took regular medicines, stayed active, did household work for both of us, took active interest in life, prayed regularly and basically had a good life. She was my mother, friend, mate, companion everything. Thrice we went to hospital emergencies past midnight, because she felt uneasy in chest. There they would monitor her BP and other things and she would come back fine. Hospitals would advise angiography but our Govt. doctors advised against it. On 15th Feb. 2016, she had the similar uneasiness. This time, I took her to neighbor who is a nurse in cardiology department. She checked her, changed her medicine of acidity and told us to rest at night and if not feel better, then go to hospital in the day. Mother slept well, got up very late, but felt better during the day, continued with her daily routine, sat in the garden with her friends, chit chat with them, walked on grass, to stay fit. When she came back, she said she was not feeling good. But then her health looked better since last night. I cooked food for her, (after months, as it was always she who cooked food). She ate lunch, appreciated my cooking, then again said she did not feel good. Then after that she went to sleep. At 5.30 pm I went to her room and she asked me if I was making tea. I told her to rest for 20 minutes more. With that I came back to TV room. But Mummy too followed me, instead of resting. She went to the washroom and then came and sat in front of me, on the sofa. Then she lied down on the sofa. Within 30 sec. she took a long breath and stared at the roof and then went unconscious. I called the next door nurse again, she did CPR nothing happened. All my neighbors took her to hospital within 20 minutes, but there she was declared dead, reason being Cardiac Arrest. Now, this is killing me. Why didn’t I take her to hospital like before, instead of going to next door nurse? Why did I take a chance? She could have been saved in the hospital, like 3 times earlier. People tell me it was destiny. I say, whenever we went to hospitals, she survived. This time we didn’t go, she did not survive. So, I am to be blamed. Why did I blindly trusted the nurse and took a chance with my beloved mother’s life? Why didn’t I go to hospital? At the most they would have said, she was fine. Now, I read that cardiac arrest can be prevented, if symptoms are recognized and one reaches the hospital in time. Here we had the full day, yet we didn’t go to hospital. People tell me that my mother had a good life, because of me. I gave her support, company and all the comforts of life. But then I add, I gave her death too. People say, that she had a fulfilling life and a peaceful & instant death. But that does not console me. I feel like a murderer. She trusted me for her life, for her health. I betrayed her. She could have been saved. She does appear in my dreams. And mostly in my dream, we are in the hospital and she is recovering and getting discharged in good health. This could have been a reality. She wanted to live for me. I wanted her to live. We were having a fantastic, carefree life, the best phase of my life. But because of my foolishness, I lost the most precious person of my life, for whom I claimed, I was living. Now, I want to join her as quickly as possible. I have caring relatives, neighbors, friends and married sisters’ families. But I feel my mother is lonely without me. I want to speak to her. I am sorry for writing such a long message. But then this is all that has been going on in my mind. I’m very sorry to hear about the death of your mother, and its devastating impact on you. I do understand that you feel guilty for her death, and that makes things worse. That is something you will have to struggle with and work out in your own mind and heart over time. However, please also keep in mind that these things are in God’s hands. Perhaps it was time for your mother to go, and that is why things unfolded as they did. From a spiritual perspective death, especially when it comes after a person has had a full life, is not a disaster, but rather a natural part of life, and a transition to the next life. As your friends and family say, your mother had a fulfilling life and a peaceful death, and that is exactly what many people who have reached their elder years wish for. It is very hard on you. But for your mother, it is a blessing that she never had to experience her faculties ebbing away until she was no longer able to do any of the things she loved to do. Her death was quick and merciful. And though you may feel that she is lonely without you, don’t forget that she has now rejoined your father and all of her friends and family that have died before her. She is not alone. You are the one who is now alone, and I believe she is looking down on you from heaven with concern, while hoping and praying that you will find new reasons to move forward with your life. As I said in the article, the death of our parents marks a major transition in our life. And since you were particularly close to your mother, and shared your life with her up until her death, it is an especially big transition for you. Though it may be hard for you to shake the feelings of guilt over her death, I would suggest that you do your best to focus instead on the good life that you gave her, and that the two of you had together for the years after your father died. Some old people do live out their elder years in loneliness. Your mother never had to suffer that because you were her constant companion. She has now moved on to the next phase of her life, in the spiritual world. And now you have the great challenge of moving forward in your life. The previous phase, which you shared with your parents and then with your mother, is now over. But I believe God still has something in mind for you here on earth. And I believe that your mother and father would want to see you move on to a good and fulfilling life of your own in your remaining years here on earth. Thanks for your kind words. My mother too believed in destiny and God’s decisions, but my heart still says that I let her go too easily. I did not fight or struggle for her survival. Nobody sits at home and wait for the death, despite not feeling well. My mother was unfortunate to have a daughter like me, who did not get alarmed for her life, during the last 24 hours of her life. I know I am sounding immature & a bit too emotional and if my mother was in my place, she would have overcome her emotions. She was a strong woman, I am not. My interest in life is over and I don’t feel like being normal again. Now, I shall just count my days to meet her. It is said God helps those who help themselves. I did nothing that day and so even God did not help me. Thanks for listening to my woes. However, don’t forget that you did take her to the hospital three times previously. Your care for her health and wellbeing certainly added more years to her life than she otherwise would have had. And your presence and love for her made those years much happier and more rewarding for her than they otherwise would have been. So please don’t beat yourself up too much about feeling that in the end, you dropped the ball. I suspect that your mother has a very different view of your love and care for her for so many years. Once again, our thoughts and prayers are with you as you face and struggle with your grief. I found my dad and sister in spirit. I am still on earth. I feel their presence and have a relationship with them. I will never leave them. Thanks for stopping by, and for your comment. I am glad you feel their presence with you! Dear Lee, Many thanks for writing this article i read it several times when i am anxious and feeling hurt. I feel that you understand. I experienced a lot of pain. I am now in my forties and i have four older siblings. For the past two decades I lived in various places in Europe pursuing my scientific career. My parents were proud of me. The reality was that I was also escaping from my older siblings (20-7 years older than me) who abused me in my youth. I kept it hidden from my parents and how i dealt with it (sometimes destructively). Anyway when my parents got older and sicker my siblings looked after them very well and I am thankful in many ways. However my siblings didnt let me spend time with my parents as much as i wanted to. At times i was not even given the chance to speak to my parents on the phone. After my mother died in 2008 they got worse. But i worked really hard to keep my dad proud of me. I was tired and very ill but i felt pushed. That was all i could do for him. Then I got an email from my brother informing me of my father’s death. I had a back injury and i could barely walk back then. They didnt give me any info about my dad’s funeral. I got an empty email with a photo of my father’s grave. That was 3 years ago. After my dad’s death, i felt i could not go on with my research career. I thought a break would help. I still cant read my own work it feels tainted with a lot of harsh times. I used to feel my mother around me most of the time. The night before my father died he said goodbye to me in my dream. I dreamt that a caravan of spirits beautifully dressed carried a throne adorned with jewels were there to collect my father. They told me they were going to take him into the city of lights. My father then sat on his throne and he held my hands and he told me it was time for him to go as his body is broken. Subsequent dreams i saw him telling me he can walk and he was free of pain. I think they are around me and when i feel empty and sad i know that its my preception and not that they are not with me. Despite my hard experiences with my siblings i love them but i never want to meet them. Strangely when i think of my family in heaven it only involves my parents without my siblings.i regret that i should have done more for my parents. The love for my parents will never die. I hope they will pick me up when its destined. I’m sorry to hear of all your struggles in life. And I’m glad this article is helpful to you. Your parents are now in a place where they can see things with a clarity beyond anything they had here on earth. I am sure they understand about your struggles and efforts, and about your sibling conflicts and divides. Of course you will have times of feeling empty, and times in which you feel you could have done more. But consider that what good parents most want to see in their children is that they live a fulfilling and useful life. And you did that throughout your parents’ lifetimes here on earth. I believe that even if you were separated from them physically, they took satisfaction in watching your life unfold. I do hope you’ll be able to move through and past your regrets and your grief, recognize that your parents did love you and continue to love you, and that you will be able to move forward with your life during your remaining years here on earth. It’s not easy, I know. But I feel sure that this is what your parents hope for you also from their place in heaven. But why is it that your belief on this matter does not have any biblical reference? Is it that the Bible does not support your views of seeing ones parents again after death, and other after death experiences? You know I usually like to make God’s Word the basis of my decisions and beliefs. The Bible is primarily concerned with what we need to know in order to believe in God, live a good life, and be saved. And on the basic Christian doctrines that are essential to salvation, the Bible is and should be the primary source for Christian faith and life. However, there are many less critical issues on which the Bible does not give us a lot of information. The exact nature of the afterlife is one of those issues. We don’t really need know know exactly what the afterlife is like in order to believe in God, live according to God’s commandments, and be saved. So the Bible doesn’t take a lot of time telling us exactly what the afterlife is like. For that, we need to turn to other sources. It’s not that the Bible doesn’t support these views. It’s that the Bible doesn’t consider them critical for salvation, and therefore doesn’t focus on them. Thanks for the response Lee. So my question is, incarnation and reincarnation, are they the same or different? And does incarnation truly happen? How does your pastor friend distinguish between reincarnation and “incarnation” as he’s defining it? They sound like the same thing to me. And Jesus made it clear in Matthew 17:11-13 that Elijah was not literally coming again himself, but rather that this was a prophecy referring to John the Baptist. I deal more fully with the Bible passages that are sometimes interpreted as indicating reincarnation, including the prophecy of the return of Isaiah, in the article, “The Bible, Emanuel Swedenborg, and Reincarnation,” starting with the section titled, “What does the Bible say about reincarnation?” As shown there, John the Baptist couldn’t possibly be a reincarnation of Elijah because the disciples saw Elijah with Jesus after John the Baptist had died. Its really great to know your thoughts . My 40yrs elder brother dies 3 months ago and since then me and my parents are in an extremely poor mental state. Since his death I am exploring lot over the internet regarding After Life. And must mention that your thoughts really gave us a strong hope to meet him in after life. But I have a question that , if my brother takes re-birth before we ( me and my parents) die , how can we meet him again ? Or you say that that like everything this is also upon God’s grace ? Thank you for stopping by, and for your comment and question. I am sorry to hear about your brother’s death. I do hope the articles here about death and the afterlife will be comforting and helpful to you and your parents. In response to your question, being a Christian, I do not believe that we are reincarnated, but rather that we live once on this earth, and after death we go on to live forever in the spiritual world. So my belief is that you don’t have to worry about your brother being reincarnated because that is not going to happen. Whenever I feel depressed about losing my mother at an early age, I come back to these articles and I am hopeful once again. Thank you Lee for the insights that you freely give to us who are grieving. You said Emanuel Swedenborg visited the spiritual world, was he a medium or a spiritualist? If so, why then do you tell us not to contact spirits – when we want to make contact with the ones who have gone before us – because we aren’t sure which spirit will receive your contact? What if Emanuel contacted the wrong spirits, the ones who told him and showed him what he wanted to see? How is Emanuel different from other mediums and psychics of today? I’m sorry to hear about your losing your mother when you were young. That is very hard. I’m glad to hear that this and the other articles here are helpful to you. About your question, Swedenborg was not a medium or psychic. What he did was very different from what mediums and psychics do. They hear voices and sense presences in their minds. Swedenborg, by contrast, had his spiritual senses fully opened so that he could be present and travel around in the spiritual world in the very same way that happens to all of us after we die, except for him it happened while he was still alive in his physical body here on earth. I will admit, I WANT to believe there is something more to us … and to ‘life’, than this. It can be very difficult at times and I can get very cynical. I have been seriously depressed for the better part of 8 years now I feel. In 2008, my wife and I suffered the heart wrenching situation of a baby born with severe birth defects. He lived for 3 months in the NICU, and then he passed away. We never got to take him home, and we barely ever got to even hold him. I am positive that this major depression started then, and has been further enlarged ever since with the passing of my grandfather 3 months later in 2008, my grandmother in 2014, and my mother in 2015. I am an only child, and it feels like death is everywhere around me. My dad has 3 brothers, and 2 of them, both younger than him, also passes away within the past 8 years. I am an only child, and all I have left is my father, who has a laundry list of health problems of his own. I feel so alone …. and I am scared now of everything. I have become so petrified of ‘life’ overall that, over the past 2 years, I have become more and more closed off, shutting out family and friends. It is emotionally and mentally painful to be around people anymore, and I feel like I have fallen into this enormous hole that I’ll never get out of. I was raised Catholic, and I went to Catholic schools my whole life. However, several decades ago I stopped being a ‘practicing’ Catholic. I have also struggled very much with the idea of an afterlife of any sort …. anything our conscious mind is aware of (like a before and an after). With these past 8 years resulting in so much death around me, I want to believe that I will see them all again some day. That I would be able to hold my son and that I would be able to speak with my mom again, and hug her – tell her I love her. She died so young and it all happened so fast. She was working full time still and in well enough health just 2 1/2 years ago. Within a period of about 18 to 20 months she went from that, to passing away from several ailments. She was in constant pain, and was suffering so much, all while slowly losing her mental capacity too – and all I could do is sit by and watch. There was nothing I could do to help her. It’s been 8 months now and I don’t feel as if i have truly grieved her loss. I don’t think I know how. I am cold, and disconnected now. I am miserable, and I make my wife and my children miserable too – I know it. And all I can think about anymore is that my life is over half way over now and I can’t believe its all gone already.- and I am closer to death than birth now. Everything hurts …. so I do nothing and I hide. I want very badly to think that when I do pass away that I will reunite with my mother and father, and my wife, and our children, and that all of this time on earth MEANT something ….. and isn’t some sick cosmic joke being played on all of us. Thanks for stopping by, and for sharing your pain and your struggles here. I am very sorry to hear about all your loved ones who have died, especially your son. Losing a child is one of the most painful, heart-wrenching things anyone can go through. Though you must go through your own process of grieving, I would also offer you this article, which might help: Where are my Children who have Died? Will I Ever See Them Again? About the death of your mother and your parents’ generation, and your father’s likely approaching death, I would suggest that what I discussed in this article above is now happening in your life. Those who raised you and provided you with a sense of home, family, stability, and support are now leaving this world. That is causing you to go through the transition to being the adult who is in charge, who is the head of the household and the clan, and who must build your own life as an intellectually and emotionally independent adult who is now the one that passes the values and emotional support down to your children and, in time, your grandchildren. This is how the cycle of human life works here on earth. As painful and draining as that transition may be for many of us, it is one that we must go through as part of our journey of psychological and spiritual development into fully mature adult human beings. And now your time of moving into the position of one of the elders in your family is coming. For the sake of your children, it’s important that you step into that role, as much as you might wish that your parents, uncles, and aunts could still fulfill it. They are moving on to eternal life. You must now step into their shoes in your family, but as your own person rather than as a stand-in for them. And of course, you can do this together with your wife, who is the one you must now look to for your psychological and emotional support and for a companion to share the burden of caring for, leading, and guiding your children and your future grandchildren. When your parents begin dying one after another, it can lead to a new and closer phase of marriage for those who are able to make the transition. I don’t know anything about your relationship with your wife. But assuming there is a basic foundation in your marriage, I would urge you not to cut your wife out of your emotional life and struggles, but to share them with her, and let her share hers with you. The two of you are married for many reasons, one of which is to be a help and support to one another. And this can be a powerful forum and field for spiritual growth for both of you. For more on this, please see: How does Marriage Fit In with a Spiritual Life? Is There Marriage in Heaven? And of course, as they lose their grandparents, your children need you now more than ever. Even if you are struggling and feeling empty inside, you must treat them with kindness, show them love, and offer them guidance from your own knowledge and life experience. You are the only father they have. Even as you yourself are dealing with your own inner turmoil, you can provide them with the sense of security and of being loved that they need to grow into solid, self-responsible, and self-respecting adults in their own right. 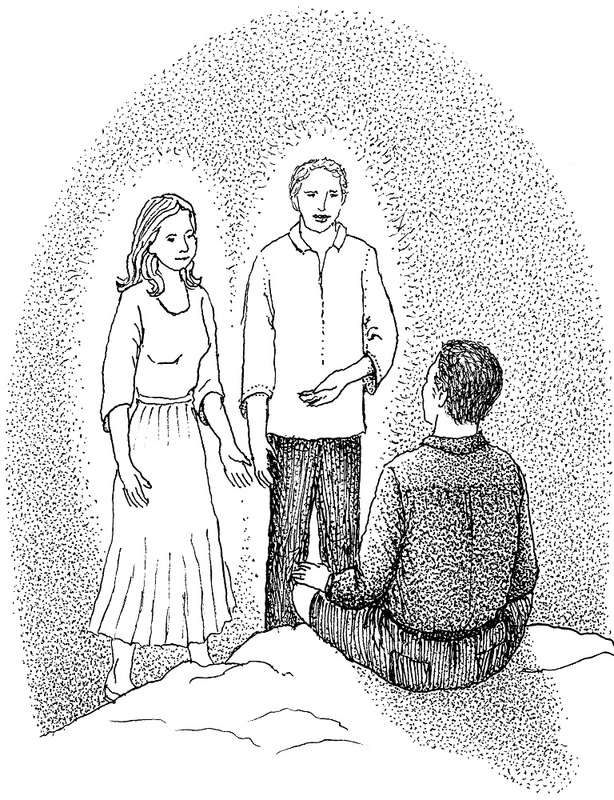 For more on this, please see: How Can I Raise My Children from a Spiritual Perspective? All of this may seem just too overwhelming. But you don’t have to deal with it all at once. You just have to deal with each day’s own challenges and opportunities while you gradually work through your own painful transition as the people you have looked to and depended upon all your life move on the next life. If you have any questions as you read, please feel free to ask. And if I can be of any further help to you, please feel free to continue the conversation. Annette and I wish you godspeed on your spiritual journey, as troubling as it may be for you right now. Lee, I have a question what if you go to hell, can you meet your parents? I really get depressed when I think my parents are going to die. When we die, we do not go immediately to heaven or hell. Instead, we go to a temporary place that Swedenborg calls “the world of spirits.” That is where everyone lives after they die until they are ready to move on to their final home in either heaven or hell. Some people are there for a shorter time, some for a longer time, up to the spiritual equivalent of several decades of time here on earth. For more on this, see: What Happens To Us When We Die? This means that no matter where your final home is, you will have the opportunity to see family and friends again in the world of spirits. And even if you or they have gone on to your final homes in either heaven or hell, in the spiritual world people can still visit with one another over great distances if they want to. I am a little concerned, though, that you seem to think you are going to hell. I don’t know what you’ve been taught, but I really doubt that you’re going to hell. You seem like a thoughtful person who feels deeply about things. And that doesn’t sound like the type of person who’s heading for hell. Please see: If You Think You’re Going to Hell, Please Read This First. Finally, about your parents, may I suggest that instead of focusing on their future death, you make the best of this time when they are still living here on earth? You don’t know how many more years they will live. But you do know that they are here now. Take advantage of that. Tell them that you love them and appreciate them. If you are an adult now, get to know them as people, and enjoy your relationship with them. Listen to their stories. Then, when it comes their time to move on to the next life, you will have no regrets and no unfinished business. You will be able to treasure the rich times you spent with them, and look forward to your reunion with them when your own life here on earth is over. You are very welcome. I’m glad to hear it! I am not sure about my grandfather’s and grandmother’s. I am always sad with my loved ones because they are not Christian. I am almost Christian and little Hinduism so I believe both religion at the moment. Hinduism do believe in heaven and hell as well. I am definitely wants to see my grandparent’s but they are Hinduism. How I will see again my grandparents? I am not sure Will I believe going to heaven and see my grandparents and loved ones (family relatives) but all are Hindus? Do Hindu people believe afterlife going to heaven? rather than rebirth cycle in the earth that means we will never see again my loved ones and family relatives! People of all religions go to heaven if they believe in God as their religion teaches them to believe, and live a good life of love and service to their fellow human beings as their religion teaches them to live. Reincarnation as taught in Hinduism and various other Eastern religions does not actually happen. We have one lifetime here on earth. Then we live forever in the spiritual world, either in heaven or in hell depending upon the choices we have made and the life we have lived here on earth. Assuming your grandparents are good people, I believe you will see them again in heaven, regardless of their religion. It is not what we believe that determines whether we will go to heaven or hell, but how we live based on what we believe. I hope these articles are helpful and enlightening for you! Thank you for stopping by, and for your comment. I am glad to hear that this site is helpful to you. And I’m sorry to hear about all your losses. The short answer to your question is Yes! You will see your father again once you leave this earth, and he will be every bit as real and huggable as he was here on earth. Technically he won’t have a physical body, but rather a spiritual body. However, our spiritual body is just as real and tangible in the spiritual world as our physical body is in the physical body. The main difference is that instead of growing older, we grow younger, until we reach the peak condition of early adulthood. I hope these articles will satisfy your mind and your heart. If you have any further thoughts or questions as you read, please don’t hesitate to leave further comments. Lee, How can you be so sure of your beliefs? Is there any proof of your belief? I lost my dad one month back and feeling a hollow , tired , nervous , no confidence .I am not able to accept the fact that he is gone. Thanks for stopping by, and for your comment. I am very sorry to hear about your father’s death. I hope this article has given you some hope and comfort as you grieve his loss. Our thoughts and prayers are with you. My dad passed away 3 weeks ago and am finding it very difficult to accept that his gone. I wana know that he is ok and that someday i will definitely see him again. Life isnt the same without him. Thanks for stopping by, and for your comment. I’m sorry to hear about your father’s recent death. Our thoughts and prayers are with you as you grieve his passing. I hope this article has given you some comfort and hope. I am visiting here after a long time.I had communicated with you in 2015 about my mother passin on to afterlife.So much has happened meanwhile.While I was griving here,my father fell critically ill.I ruhsed to see him.I wsa able to be with him and see him,but he was on vetilator and was unable to talk.It broke my heart to see him like that.this happened 4 months after my mother crossing over.He left his physical body in few days after I went to see him.Atleast he knew I was there and was nodding his head sometimes for my talks.Once he opened his eyes and was delightful seeing me.that lasted a moment.But it is forever in my heart,that beaufitul moments.I stayed till all the formalities are over. (all these happened over an year ago.I grieved a lot after I reached back hime here.Since I am so far,I sometimes feel that they are still there.I missed them so much that I coudn’t bear.I realized again,it was guilt that I couldn’t go immediately after my mother passing to be with him made me feel this way.But now I have accepted and could let go(sometimes I still do grieve)since I know that there are fine and safer and will be there.Meanhwile,my health deteriorated so much that I can’t even bring myself to grieve and feel sad much.Right now,all I want to do is feel better and be healthy and get back to my new phase without them physically being here.I am too drained out. All I can say here,anyone greiving please take care of your health. Good to hear from you again. Sounds like it has been an eventful couple of years for you, to say the least. I am sorry, but not surprised, to hear about your father’s death. It’s fairly common for husbands (or wives) to die not long after their wife (or husband) died. My own mother died nine months after my father. They had been happily married for over sixty years. Grieving can last a long time. I do hope you’re able to get back to your own life, and take care of your physical and mental health. Your parents would want that for you. Meanwhile, our thoughts and prayers are with you. Thank you Lee,I appreciate that you take time to respond and care. why do you think that they pass on soon after each other? My father missed and would see her vision while praying everyday.I used to talk everyday with him and constantly in touch.He was my spiritual anchor.We used to discuss so many things that it is hard to relate to others.He was a knowledge bank and incredible memory,I would talk to him first for any valid info.I feel at so lost sometimes.I am relying on the values and knowledge my parents passed on and trying to live my own life. When the souls of two people are bound together with each other, it is hard for them to live without each other. Often after one passes the other just loses the will to live. More practically, they commonly take care of each other physically and emotionally, and don’t do well without the other to mind and care for them. Even if one is relatively healthy and is caring for the other who is unhealthy, that commonly gives the one a reason to get up each day and take care of him- or herself: to care for the other one. I know that once my father was gone, my mother didn’t have so much to live for, especially since her own health was compromised. Now that your father has also passed on, you might gain more meaning from re-reading the above article, if you haven’t already. Your life is going through a major transition now that both of your parents are gone from this earth. Though their voice and wisdom will always be with you, you must now live your own life, chart your own course, and develop your own wisdom. My grandmother just passed away 2 days ago, i was really depressing. My grandfather died 12 years ago. Thanks for stopping by, and for your comment. I’m sorry to hear about the death of your grandmother. I hope this article is helpful to you. I also sometimes wish I could talk to my parents to learn something about their growing up years and background. But now that they are gone, so is the key source of that knowledge—as long as I am still living here on this earth. Though you may not be able to learn more of your grandparents’ stories, you can still hold on to the ones they did tell you, and treasure them in your heart. Even if some things about our parents and grandparents will always be a mystery to us, they continue to live within us and to form part of who we are. I have lost my mom just few days back, it seems it was suicide……………there are some issues with her…………….at last she fell down in bore well commiting suicide…however till now investigation is goin on…….I was very much attached with my mom………..how will I spk to my mom ?……………and I want my mom to be reincarnate / rebirth in my family as my child? how it will be possible ? It is really pleasure for me to hear from you about the ans of my query………….indeed it is very painful to loose some one we love and it is next to impossible to run the life as it before……As you said I can see my mom again, not through reincarnation & she wouldn’t be the same person anyway. even I do not mind to see her as other person through rebirth. My question is how I can pray my mom to rebirth in my family ? if not, then how will I come to know about her rebirth is taken place & after how many days ? Thanks for your reply. Glad my answer was helpful to you. Just to be clear, I do not think that reincarnation actually happens. I believe that once we die, we go on to the spiritual world and live there forever, never returning to this earth. For (a lot!) more on this, please see my article, “The Bible, Emanuel Swedenborg, and Reincarnation.” Instead, I believe that you will see you mother again when it comes your time to leave this earth for the spiritual world. Meanwhile, she is still with you in spirit, and you can honor her by living in a way that would make her happy. Yes, there will be a period of grieving for her. You miss her, and that is hard. But your mother does not want you to spend the rest of your life pining away for her. She wants you to move forward with your life and accomplish good things with it. Thanks once again for your comments and your kind words. This is what I live to do. Knowing that it is helpful to you and others is what keeps me doing it. Godspeed on your spiritual journey! Hi….firstly I am not the one who lost his parents….I am a teenager….and I spend most of my time thinking about death,of me ,of my parents and I have those scary thoughts in my mind for 4 years…I start getting those thoughts when my grandpa died and my mother went in depression and things was getting worse and worse but now my mom is alright but not me I feel some kind of depression on me of death of me and of my parents.I will not be able to talk to them..pls help me…. As you probably figured out, the above article is primarily for people whose parents die when they are well into adulthood themselves. When you’re a teenager, losing your parents is a whole different matter. And it could happen to you. However, it sounds like it is your parents who are now losing their parents, which is the way things commonly happen. Most of my own grandparents died during my growing-up years. What’s left is your fear of death. And for that, I would suggest learning more about the afterlife, and the purpose of this life, by reading some of the articles linked at the end of this one. When death and the afterlife aren’t such a great mystery anymore, the fear of them will subside on its own. And when we understand why God put us here on this earth, we can have a sense of purpose that transcends death. God made you for a reason. As you discover that reason, and what you are here to accomplish, death will no longer cause fear and depression, but rather an appreciation of the years you do have here on earth. If, as you read the linked articles about death and the purpose of our life on earth, you have more questions, please don’t hesitate to ask. Thanks for stopping by, and for your comment. I have not approved the comment simply because it was written in ALL CAPS, which can be very distracting and hard on the eyes. (See our comments policy.) However, I do appreciate your kind words, and hope you’ll visit again soon. My Dad left me on Dec 30, 2017. I miss him badly. He is my best friend and a lovely person who has great qualities. He is wise and a very simple person, has a lovely smile and there is not even a single person who hates him in his life. I cannot imagine he is not there infront of our family. I don’t know if there will be a rebirth for the ones who leave this world but if there is i really wanted to speak to my dad and ask him a wish, to have him as a father if there is a life after death. I am sorry to hear about your father’s recent death. I hope this article is helpful to you as you grieve his passing, and look forward to seeing him again when it comes your time to leave this earth for the spiritual realms. Yes your article has given some positive vibes in me but person missing is really a big blow. Every day i feel where is my dad, he should have been with us for at-least another 10 years. He was 67 years and got sudden cardiac arrest. God has taken with him in just 6-8 minutes of the stroke. Would you suggest any good books on spirituality. I wanted to see more of spiritual than the religion side. Thanks for your response. I wanted to see the positive side of life and wanted to do good to the needy people. Yes, when someone we love is taken suddenly, it is all the more difficult. Even if we do know where they’re going, their departure still leaves a big hole in our heart and our life. One of my favorite books on the spiritual side is Light In My Darkness, by Helen Keller. The link is to my brief listing of it here on the blog. My elderly mum, 81 years of age, passed on Thursday 15 March 2018. I saw her taking her last breath in my house. I was her sole caretaker for more than a decade. Mum’s life revolved around me and mine between work and her. We were very very close. She gave me 57 years of her life since the day I was in her womb. I am 56 now and an adult orphan. When my father passed on 17 years ago, my heart was broken and I was grieving. With my mum’s passing on, my heart is burnt and everything seems meaningless, worthless and unimportant. My five siblings though grieving, have somehow moved on with their family life. I am single and my house is ’empty’ now without my mum’s physical presence. I do not harbour suicidal thoughts but am pining for my mum. There’s heaviness in my chest and I am having difficulties focusing at work. I was away from work for almost 3 weeks – on medical leave since my mum’s passing on. I am thinking of taking more time off from work to come to terms with her passing on. Please advise. I’m sorry to hear about your mother’s passing. Even if she did have a good long life, when you’re the sole caretaker of an aging parent, everything I wrote about in the above article is intensified. I hope my thoughts there are helpful to you. Of course, I can’t tell you what you should do. I’m not in your shoes. Yes, you’re going to need some time to grieve. And that will continue even after this initial period. Only you will know how much time you need to take to grieve your mother’s passing. However, you do also need to continue on with your life. Given your long, close relationship with your mother, it’s inevitable that you’ll severely miss your her and long for her presence again. However, she would not want you to spend the rest of your life pining away for her. She raised you for more than that. So my main suggestion is that once you’ve had a chance to make an initial emotional recovery from her death (not that it’s in any way a full recovery), you continue on with your work and your life, as hard as that may be, and as much as your heart may not be in it at first. Sometimes we have to force ourselves to take the next steps against all inner reluctance and resistance. As I said in the article, for better or for worse your life is entering a new and very different phase now. For over a decade, as you say, the main focus of your life outside of your job was taking care of your mother. That focus is now gone, and your life simply won’t be the same. You’re going to have to come to an acceptance of that reality. After a reasonable period of grieving, you’ll need to think about what you want to do with your life next. Though you could throw yourself completely into your work, that’s not sustainable over the long term. You’ll need to find some recreational or volunteer or community involvement activities that you find enjoyable and fulfilling to provide another outlet for the warmth and care that used to go into taking care of your mother. No, it won’t be the same. But as hard as it will be, you’ll have to move on with your life even while continuing to cherish the many close years you had with your mother. She would want that for you. Another thing she would want for you is for you to develop good relationships with other people in order to fill some of the void left by her absence. We humans need human contact. There’s no need to rush into things. But over time, as you go about your work and your free-time activities, you’ll need to find people with whom you have some commonalities and connections to provide the human contact and sense of community that is part of who we are as human beings. If you do find some activities out in the community that you enjoy and that give you a sense of fulfillment, that is also a good place to meet people who are on a similar wavelength and can become part of your circle of friends. You may not be ready for all of this quite yet. But please, as you are ready, do let your mind turn to these things, and to what this new phase of your life will be all about. Though your mother’s time on this earth is now complete, given her long life you likely still have plenty of years left on this earth. And despite the pain you now feel in your heart, and the major hole in your life, the remaining years of your life can be good ones. Your time caring for your mother will always be a key part of what you accomplished in this life. But you can have other accomplishments as well without taking anything away from what you did for your mother. If you use your remaining years well, when it comes your time to complete your earthly journey you can move on with a sense of satisfaction in a life well lived. And then, when you see your mother again in the spiritual world, you can tell her the story of your life. You can tell her about the many and varied things you experienced, about the friendships you made, and about the good things you accomplished. And I know that she will be smiling with joy as you tell her that story. Thank you for your wise counsel. Come tomorrow, April 15, it will a month since my dear mother had entered another dimension. It’s been a week since I returned to work. I am looking forward to the day when I reunite with my dear parents. That would be bliss. Thank you for listening to me. You are most welcome. I’m glad you’ve been able to return to work, and I wish you the best as you move forward into this new phase of your life even while honoring the previous phase. Dear Lee, my mother left us on the 12 of April at the eve of my Birthday which was on the 13. Its not easy right now for me, my father and my brother. I have read your article after searching and trying to find how i can change the way i see things now. She has done everything she could to help me in every steps i made in my life since i was born, no one can replace her, i’m now 43, she was 64. I may ask you Lee, do you think she has her eyes on us every second, is she present everywhere? I’m doubting a lot of things if i will see her again. My life partner is saying that i should stop crying as she is saThanks a lot Mr Lee for the words, i hope my mother hear me now. Thank you. I’m sorry to hear about your mother’s death. Our thoughts and prayers are with you and your family. Though your mother is not literally present everywhere (only God is), she is present wherever you, your father, and your brother are because she is present from within, in spirit, rather than in a physical way. Since she is now living in the spiritual world, her presence is with your thoughts and feelings. And since you were the people she most loved, you will be continually present in her heart and mind, even if her thoughts do go elsewhere as well—similar to how it was with her when she was still living on earth. Still, you’ll need time to grieve her death. Even if she is safe and sound in the spiritual world, you’ll still miss her physical presence, her words, and the things she did here on earth. Here’s wishing you solace and the will to move forward with your life as the days, weeks, and months pass. Dear Lee, thank you for those words, its the most valuable at the moment. I lost my mom on April 4,2018 suddenly to a heart attack. She was my best friend we were inseparable and how that she is now here I am completely devastated. I miss her so much and I wonder if she is still able to see me. Can she see how much i am suffering without her? Can she still feel my love? I find no comfort in doing anything nothing makes sense without her. I feel like the past weeks have been a blur and I don’t know how I have been able to function without her. I’m so sorry to hear about your mother’s death. I hope this article gives you some help and comfort as time goes by. Right now her departure is still very recent and fresh. It’s bound to cause a lot of pain and dislocation. But yes, your mother can still feel your love and your suffering. Even if there is no conscious communication between the two of you as there was before, she is still present with you in spirit. I hope you are able to give yourself some time to grieve, and to rebuild a new and different life for yourself now that your mother is gone from this earthly plane. Though she is no longer physically present with you, her spirit lives on not only in heaven, but in your own heart and mind. Thank you for your kind words. My mom would have been 79 on May 19th. She had some health issues due to diabetes but I lost her suddenly to a heart attack on April 4th. I always thought she would pass of old age so to loose her in a matter of one hour and 30min has completely shattered my world. You said that she is now she is with me now in spirit and that she can steel feel how much I love her and miss her. Can they hear us if we talk to them? We would talk about 4 times during the day and she was my first call when I would leave work to let her know I was on my way home ( her house ) and now what I can’t call her i find myself talking to her when I leave work just as I did when she was alive. Can she hear me? She won’t necessarily hear the specific words you are saying in your mind, but she’ll sense the thoughts and feelings behind them. Spiritual thought and speech is not quite the same as earthly thought and speech. For example, if we’re talking to someone about our work day, angels and spirits will not pick up on the specific events, such as a computer malfunction that delayed a job for an hour, but on the feelings and struggles and learnings that accompanied it. So yes, she can “hear” you, but what she hears is something beyond the particular words you’re saying and daily events you’re telling her about.